Lean Thinking: Why Are Learning Organizations So Scarce? Why Are Learning Organizations So Scarce? There are many root causes, which our blog explores at length. Our business & professional schools teach us to think in a way inimical to learning. Corollary: What can front line people possibly teach us? Problems are bad things - smart, successful managers like us shouldn't have problems! Sadly, the present "splitting" we're seeing in society can reinforce such thinking. "I am very smart and successful - and I just received a massive bonus to prove it!" Hubris, disconnection from the front line (where most value is created), apathy & cynicism in the organization. In other words, an environment that precludes learning. People go to professional and business schools with the best of intentions. To develop their skills, advance their careers and so on. But we often get more than we bargained for. The interesting thing is that these mental models are never articulated. They are in the atmosphere, invisible, accepted and unquestioned. 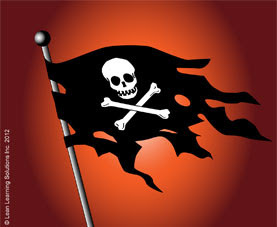 The great Henry Mintzberg has said that MBA graduates should have a skull & crossbones tattooed to their foreheads. I am in the process of teaching my son these life lessons. He is currently in Engineering at college and is doing well on every front but the one that seems to matter most in life. I will continue to learn and teach on this front.